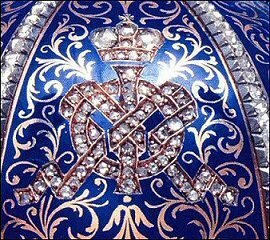 The 12 Monogram Egg/Alexander III Portraits Egg, (also known as 12 Panel Egg), is made of translucent blue enamel, red gold, rose-cut diamonds, portrait diamonds and velvet lining. The gold Egg is covered with six panels, each divided by bands set with rose-cut diamonds, and decorated with the Imperial crown and the Imperial monograms "MF" (Maria Feodorovna) and "AIII" (Alexander III), which are set in rose-cut diamonds. Each monogram appears six times, totaling 12. A portrait diamond surrounded by smaller diamonds surmounts the Egg and another one is set under the Egg. 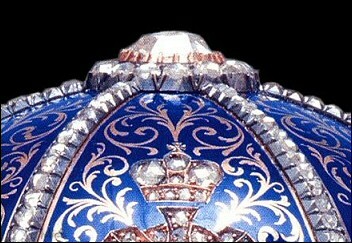 Maria Feodorovna's monogram appears on the top half of the Egg, Alexander III's on the bottom halve. The Egg opens to reveal a velvet lining for the surprise, which is now lost. 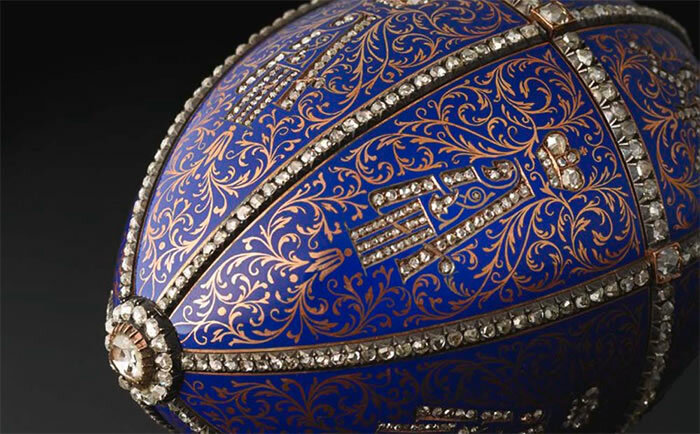 This Egg was long thought to be the 1892 gift for the Imperial Couple's 25th wedding anniversary, but later research proved that the 12 Monogram Egg was presented to Maria Feodorovna at Easter in 1895, in memory of Tsar Alexander III, who had died the previous November. In November 2008 new research proved that this Egg had to be one and the same egg as the missing Alexander III Portraits Egg, and was presented to Maria Feodorovna as remembrance to Alexander III and the fact that the Imperial couple's married 30 years earlier, in 1866. The surprise this egg contained must have been the six portraits of Alexander III, mentioned on the bill for the 1896 Egg. Could it be that the frame with 6 portraits of Alexander III that Grand Duchess Xenia (daughter of Maria Feodorovna) lent to an exhibition in London in 1935, be the same as the surprise from this Egg? For now, only history knows. Read all about this research on the Fabergé Research Site, THE FABERGÉ IMPERIAL EASTER EGGS: New Discoveries Revise Timeline. The 1896 12 Monogram Egg / Alexander III Portraits Egg was the first in what would become no less than four Imperial Eggs directly commemorating Alexander III, either through miniature paintings or through sculptures. The other three Eggs are the 1902 Empire Nephrite Egg (missing), the 1909 Alexander III Commemorative Egg (missing) and the 1910 Alexander III Equestrian Egg. In the 1920's probably sold by Russian officials to a Paris-based jeweler. Owned by a Mrs. Berchielli, Italy. 1949 Bought by Marjorie Merriweather Post, General Foods heiress. 1973 Collection of the late Marjorie Merriweather Post, willed to Hillwood Museum, Washington. D.C.
(1) von Habsburg, Géza, Fabergé: Treasures of Imperial Russia, 2004, 66. For more info about the redating of this and other Imperial Eggs, see also The discovery of a Photograph for the Missing 1887 Egg on the Fabergé Research Site. Wonderful news for the Egg enthousiasts, the missing miniature of the Egg is now known thanks to Fabergé researchers Anna and Vincent Palmade. Their discovery was first published in the Fabergé Research Newsletter, January 2015. Here below their story, courtesy and copyright the Fabergé Research Site, Newsletter Winter 2014-2015. In our auction catalog research we found four photographs of the surprise - a folding miniature frame. Whereabouts of the frame is currently unknown, however, we hope the surprise may be alive and well in the care of an unsuspecting collector. 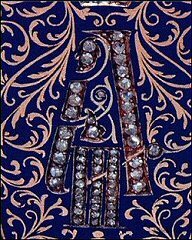 A folding screen with six frames and ten sapphires fits perfectly the description in the Fabergé invoice. 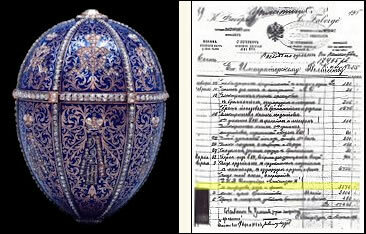 Like the egg, the object is signed by Mikhail Perkhin, Fabergé’s head workmaster active from 1886 until his death in 1903, and has the assay mark of the city of St. Petersburg before 1899. The portraits of Emperor Alexander III are missing. Are they still with descendants of Empress Maria Feodorovna? The auction catalog provenance also fits perfectly. 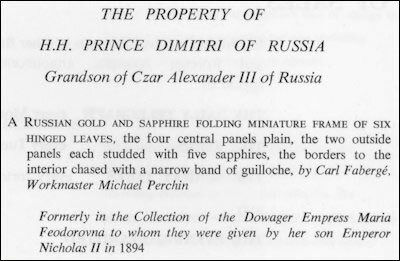 Prince Dimitri (1901-1980), who in 1961 sold the object at Christie’s London, was the 4th son of Grand Duchess Xenia Alexandrovna, who was the 1st daughter of Maria Feodorovna and Alexander III. The 1961 catalog states the object was a gift from Nicholas II to Maria Fedorovna in 1894 (based on the revised timeline it was an Easter 1896 gift). 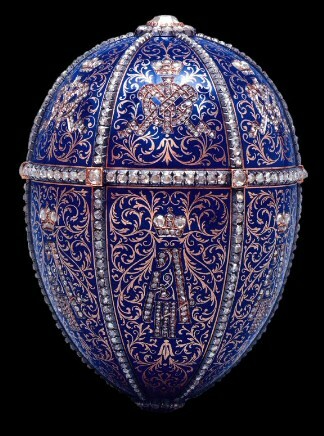 Lowes and McCanless in Fabergé Eggs: A Retrospective Encyclopedia, 2001, 46, point out this frame was shown at the 1935 London Exhibition of Russian Art, item 559, case III - Ornaments by Fabergé. The description reads: "The Emperor Alexander. Six miniatures in different uniforms by Zehngraf. Lent by H.I.H. The Grand Duchess Xenia of Russia, Windsor." 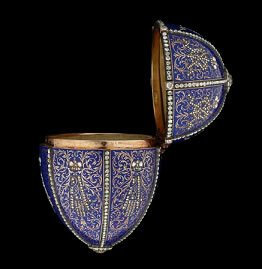 The sapphires match the deep royal blue of the egg's champlevé enamel and the red gold of the object is a match to the red gold of the elaborate patterns engraved within the enamel. The Hillwood Museum staff tested a replica of the surprise inside their egg. The replica was built using the dimensions and the illustrations mentioned in the publications. It fitted the inside of the egg so perfectly that it was barely able to move within its confines. The four top corners of the folded screen match exactly the four marks on the velvet lining in the inside of the top portion of the egg. It is our hope this new information will reunite the surprise with the 1896 Alexander III Portraits Egg in the Post Collection. We would like to thank the staff at Hillwood Museum for their very kind and generous cooperation, Kieran McCarthy at Wartski who supported our research, and Annemiek Wintraecken and Christel McCanless for their indomitable and continued support. 2018 - The 1896 12 Monogram Egg Opened.